John Crowe is the top North American executive for Saint-Gobain, the $55 billion- a-year French construction- materials maker that traces its roots to the group that built Versailles for King Louis XIV. 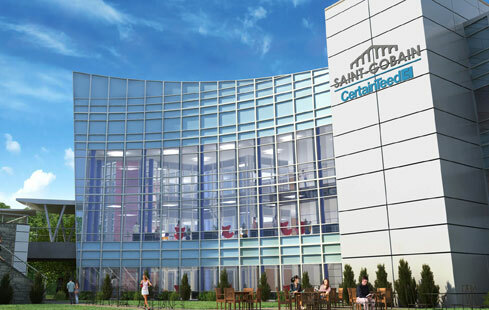 Crowe has been looking for a place to build another palace – in Pennsylvania – as Saint-Gobain’s U.S. base and showroom. To replace the company’s aging U.S. headquarters near Valley Forge, Crowe scouted sites for “an absolutely spectacular building that will incorporate all aspects of what we know as a building-materials company in terms of energy efficiency and a sustainable, open, collaborative workplace,” he tells me. Plus, a research and development center to replace the old labs in Blue Bell. The search, extended by the recession, took Saint- Gobain six years. The company plans to announce this week that it has picked a potentially spectacular fixer-upper, an $80 million-plus expansion of the once-innovative but now-rusted and vacant complex built in 1969 by the former National Liberty Life Insurance Co. on 65 acres north of Malvern, close to the new State Route 29 ramp from the Pennsylvania Turnpike.